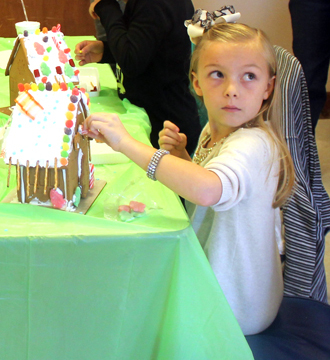 Abigail Jowers, 8, a second-grader at Yeso Elementary School, puts the finishing touches on her gingerbread house Saturday morning during the Artesia Arts Council’s 12th Annual Gingerbread House Workshop at First Presbyterian Church. Education Director Lauren Austin reported a good turnout for this year’s event, with 50 participants having pre-registered. 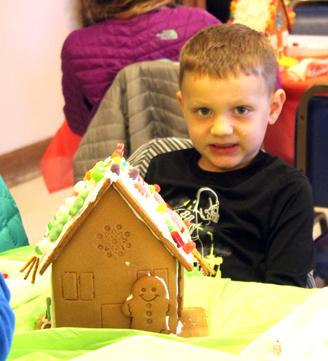 Participants were supplied with everything one could imagine in order to create their one-of-a-kind gingerbread houses and ranged in age from the very young to the very young at heart. 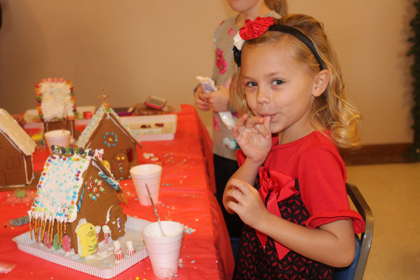 At right, 7-year-old Macy Yates, a second-grader at Yeso, delights in the tasty frosting she was using to adorn her gingerbread house. Below, Kason Hamilton, 4, poses for the camera as he decides on the next addition to his gingerbread creation.